PM Netanyahu speaks about upcoming meeting with Putin, says Israel may be forced to attack Iranian bases in Syria. Israeli Prime Minister Binyamin Netanyahu spoke on Sunday about his upcoming meeting with Russian President Vladimir Putin. 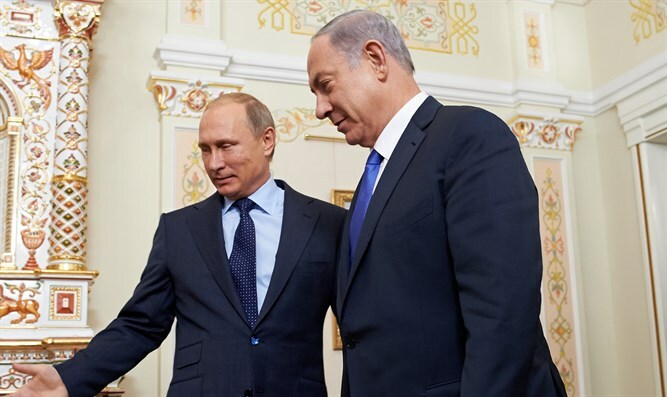 At their upcoming meeting scheduled for Thursday, Netanyahu intends to speak with Putin about Israel's opposition to the Iranian attempts to establish a permanent military and naval presence in Syria. "On Thursday I will meet with Russian President Vladimir Putin in Moscow. One of the most important issues we will discuss is Iran's attempt to make an agreement with Syria. With or without Syria's agreement, Iran will attempt to establish a permanent military presence in Syria, both on land and at sea. "In fact, Iran is attempting to slowly open a front with Israel in the Golan Heights. "I will tell President Putin about my extreme opposition to this plan, and about the possibility Israel will choose to attack. I hope we will be able to come to the understandings necessary to prevent as much as possible confrontations between Russian and Israeli forces - just as we have been able to do until now."